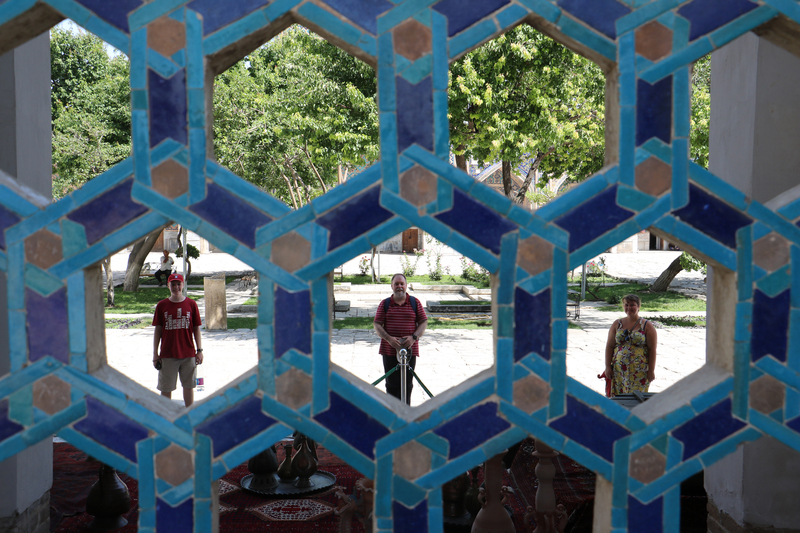 In this in-depth tour, we will explore some of Uzbekistan’s most off the beaten track sites. We’ll see a fantastic mixture of Silk Road and Soviet histories as we explore both the main attractions and some of the more unique places in these two fascinating Central Asian republics. We’ll visit a still-working Soviet-built solar furnace, ride roller coasters at Tashkentland, see a crazy fashion show, go wine tasting, and go into an Uzbek style synagogue. We’ll explore Yangiabad, a formerly closed Soviet town inhabited by exiled miners, and will peer into one of the earth’s most infamous man-made natural disasters, the elusive Aral Sea. If you’d like to explore Turkmenistan as well, you can join us on the Grand Turkmen and Uzbek Combo for the tour of a lifetime! Leaving Tashkent we’ll drive to Parkent district where we’ve been granted permission to visit the a spectacular example of Soviet technology and architecture – a solar furnace. Still functioning, though never really having managed to fulfil its purpose, it’s not open to the public. Return to Tashkent just in time for lunch. You’ll have plenty more opportunities to try plov, but there’s no better place to have it than at the Plov Centre. This gigantic hall, decorated as if for a wedding in the 1980’s, is set up for large numbers of people to eat plov in. Mixed and cooked just outside by an army of Uzbek women, it is some pretty good plov, but more than that, it is an exceptionally unique experience. Go to Tashkent TV Tower for fabulous views of the city. Visit Tashkent Land, Central Asia’s answer to Disneyland. With it’s faded welcome sign, crumbling gift shop and creaky rides, this is definitely a step back in time. Most tourists don’t make it to this gem of Soviet infrastructure, but we just can’t resist it. If you’re really game you can try out the “Boomerang” rollercoaster, or if you’d like something a bit more relaxing you can take a ride on the “African tour,” a boat trip through the jungle land. Next, we’ll visit the Museum of Railway Techniques’. 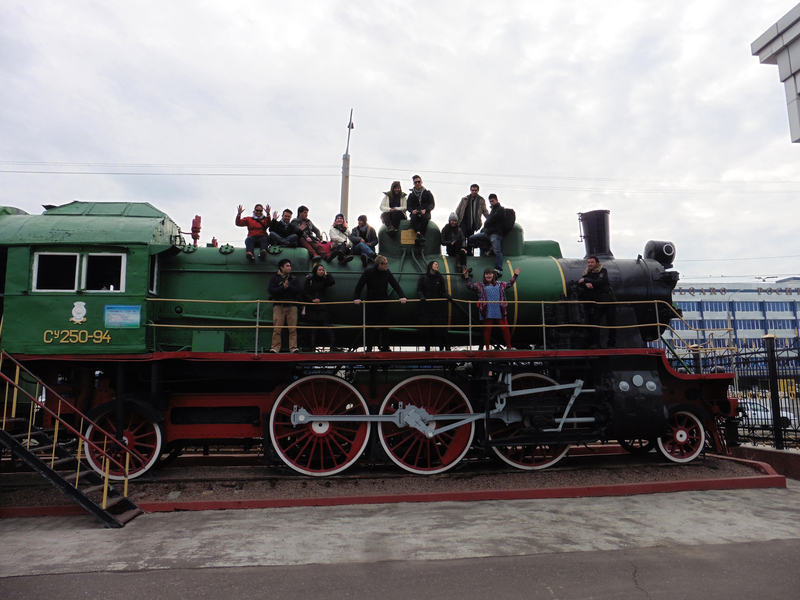 This outdoor museum is full of all sorts of old locomotives, and they don’t mind us climbing all over them. We can even take a little train ride around the train museum. You don’t have to be a train lover to enjoy this charming museum. Take a walk from Independence Square, formerly Lenin Square, through the park and past the statue of Amir Timur. Stop and browse in a small market in the park, full of old Soviet trinkets and sit under a shady pagoda for a cold drink or ice cream. Our first stop today will be the famous Chorsu Bazaar, with it’s iconic blue dome that’s now home to meat, dairy and dried fruits. Exploring the stalls you’ll learn about traditional bread-making methods, local remedies for everything including of course virility issues, and how Uzbek babies are taught to go to the toilet. Leaving Tashkent again, we’ll drive into the mountains to visit the town of Yangiabad. A closed town during the Soviet Union, not even appearing on maps, it was built as a mining town where exiles were sent. Once home to about 10,000 people, the population is now a little over 300, and noone pays them much attention. We’ll spend the afternoon wandering the streets, peeking into abandoned buildings and listening to stories from locals. We’ll spend the night at a nearby Soviet “resort”. If it’s hot you can go for a swim in the river, or if you just want to relax, we might be able to find the massage lady. Leave early in the morning to drive to Samarqand, arriving in the early afternoon. Optional wine tasting at the Khovrenko Winery, a small local wine factory with adjoining museum (admission not included). The highlight of your tour around Samarqand is likely to be the famous and spectacular Registan Square which is flanked by three beautifully decorated, sparkling blue mosaic madrassas. Once the city’s commercial centre, Registan Square is modern Samarqand’s centre piece and a pride of the Silk Road. Having died in September 2016, Islam Karimov, the First President of Uzbekistan, now has his mausoleum on the newly renamed disheveled Karimov Street in the center of the city, which of course we will visit. Winding through the narrow streets of the old city, we’ll stop at a particularly unique synagogue. Totally unrecognizable from the outside, it looks like any of the typical houses on either side, but inside is a bizarre and unique mixture of Uzbek and Jewish décor. We’ll also pay visits to Biki Khanum Mosque, Siyab Bazaar and Shah-e-Zinda. Visit Romanenko Fashion Show House, a place that is difficult to describe. This small suburban house has been transformed into a completely unique textile workshop where thirty men and women redesign ancient Central Asian clothing into colorful, modern designs. Overnight train to Nukus leaving at around 7 pm. Arrive in Nukus at around 11am. Check in and have lunch. In the afternoon we’ll visit the Museum of Savitskiy. The Karakalpakstan State Museum of Art hosts the world’s second largest collection of Russian avant garde art (after the Russian Museum in St. Petersburg). Savitskiy himself went to great lengths to save prohibited pieces of art during the Soviet Union, and amazingly you can see some of them now in this museum. Departure from Nukus first thing in the morning to drive towards the Aral Sea. Stopping at some Silk Road ruins and a canyon on the way, we’ll drive up on to the Usturt Plateau. 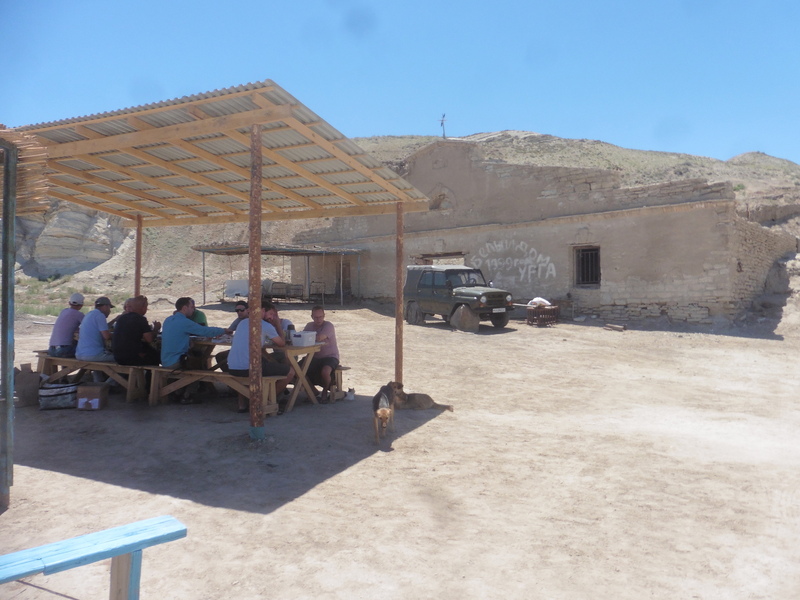 We’ll stop for a picnic lunch at a ruined Soviet Gulag, near the edge of one of the small parts of the remaining sea. Arriving at the main part of the sea, if you’re game, you can go for a swim. There used to be 10mg of salt per liter in the sea, but now with 160g (yes, grams, not milligrams) it’s not far off the Dead Sea (180g/l), and now you can easily float on top of the water. Overnight in a yurt camp near the shore (dinner included). If you want to wake up early to see the sun rise over the water, you can. Otherwise you can sleep til breakfast time. Drive to Moynak village, which used to be a thriving coastal town, but is now a disheveled and quiet desert town, most famous now for the ship cemetery. 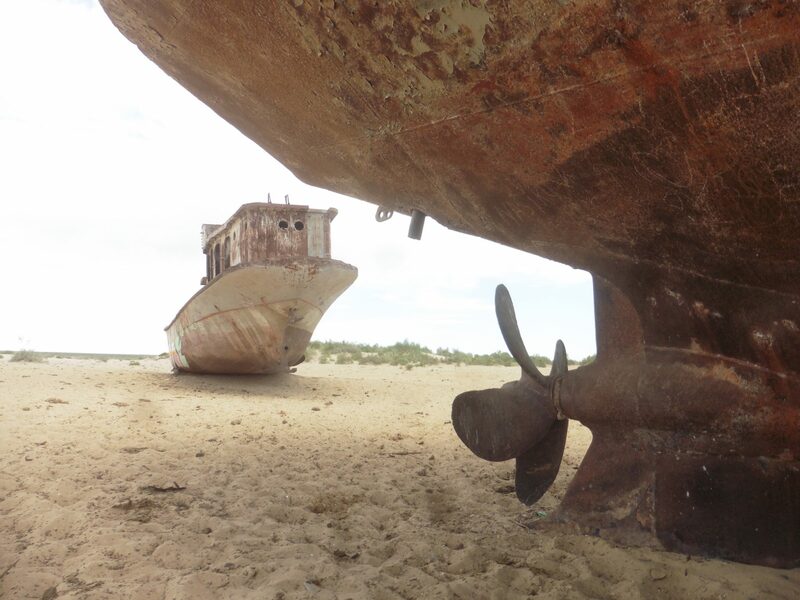 Ships lay abandoned on the old seabed as the sea receded. A lot of them were removed and destroyed, supposedly so the metal could be recycled, but a dozen or so of them were saved and are now in Moynak. Arrive back in Nukus in the early evening. Farewell, those continuing on to Turkmenistan. Fly back to Tashkent, free time for the rest of the day. Do you know what a solar furnace is? Well after our YPT exclusive tour to a Soviet built solar furnace in Uzbekistan you will. After realising that that they couldn't figure out how to use it to produce solar power, its main use was in research for aerospace engineering. Now though they also just use the extreme heat to melt metals for any company who will pay them. The Aral Sea – one of the world's most notorious man-made natural disasters, it won't be long until there's nothing left here to see. 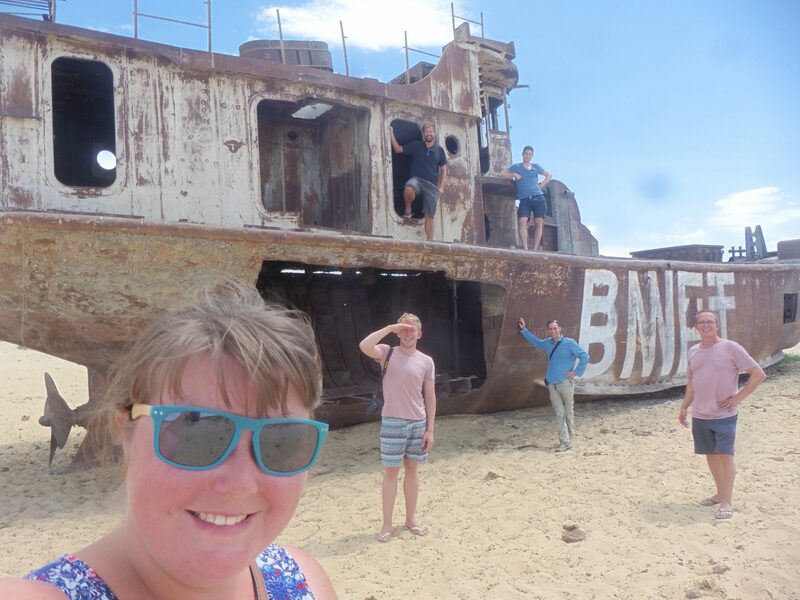 Finding shells on the desert floor and exploring abandoned, rusty ships, it's a very surreal place to be. Visiting one of the Soviet Union's infamous closed towns, Yangiabad. You'll have the opportunity to explore abandoned buildings, chat to locals and see first hand a town that didn't appear on maps until 20 years ago. • Any other personal expenses such as souvenirs.